This represents a ton of hard work by communities around the world — obviously our German & French communities are exceptionally strong as well, with the rest of Europe also making gains. 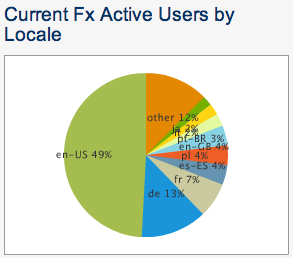 Brazil is our most significant user population outside of North America & Europe, followed by Japan. But the fastest growth is coming from “other” — our long tail of languages. I’ll grab some more information over the next few weeks to talk about growth rates & what composes other, but thought I should highlight this milestone now. I’m very proud of Mozilla to get to this point, and think it shows something very special about the global nature of what we’re up to. This entry was posted on Friday, May 18th, 2007 at 8:35 am	and is filed under Mozilla. You can follow any comments to this entry through the RSS 2.0 feed. Both comments and pings are currently closed. Are these data download stats, update stats, some kind of web usage stats or sth else? These figures probably over-represent en-US at the expense of other English versions. Often it is easier to download the US version than it is to download a specific localisation, so there will be lots of Brit using the US version. And are there Australian, Canadian and other English localisations? ian: they’re just representative of what people are using. there are 2 main English-language versions of Firefox: US, which is what we build here, and GB, which is localized by our Great Britain community. we can, of course, do other localizations, but it’s not clear that there’s a huge need. Yup and the localisers still get the disc/disk thing wrong. Disc is used for round things like CDs, Disk for things like hard drives (which may contain a round thing but themselves are not round). Link got broken up in previous posts, I’ve made my name the link this time. henrik, absolutely — that measures something different, and you’re right that it’s another important one to understand. forex trade: they’re update stats, so reflect usage, not downloads.